Summary: The little horn power of Daniel 7 can be identified by its work to change God's laws. 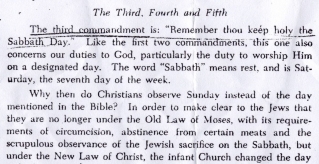 The third commandment is: "Remember thou keep holy the Sabbath Day." Catholic catechisms show that the Papacy has tried to change the law of God. The Ten Commandments have been tampered with. The Second Commandment, which refers to images and idols, is absent in Catholic literature. And to make up for the loss of one commandment, the Tenth is divided into two. 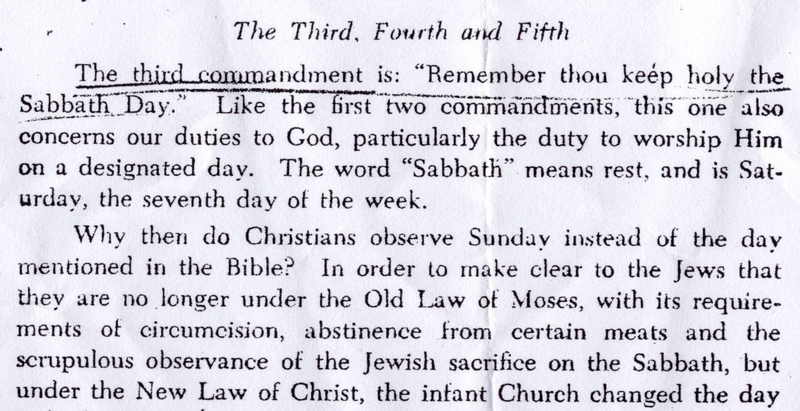 The Fourth Commandment, which talks about the Sabbath, becomes the third commandment in the Catholic catechism. The day of worship is shifted by papal decree from Saturday to Sunday. The laws and times mentioned in Daniel 7:25 are laws that God Himself has established and time that God Himself has set. The law that stands out throughout the Bible is the Ten Commandment law. Papal Rome tampered with the law of God and changed the ordinances, even though God says, "For I am the LORD, I change not" (Malachi 3:6). i. Johann Eck, Enchiridion of Commonplaces against Luther and other Enemies of the Church (translated, Baker Book House, 1979). ii. Catholic World (March 1894): 809.
iii. Catholic Mirror (September 1893). iv. Father Enright, American Sentinel (June 1, 1893): 173.